Butterflies are wonderful creatures filling the world with new colors and a good mood. 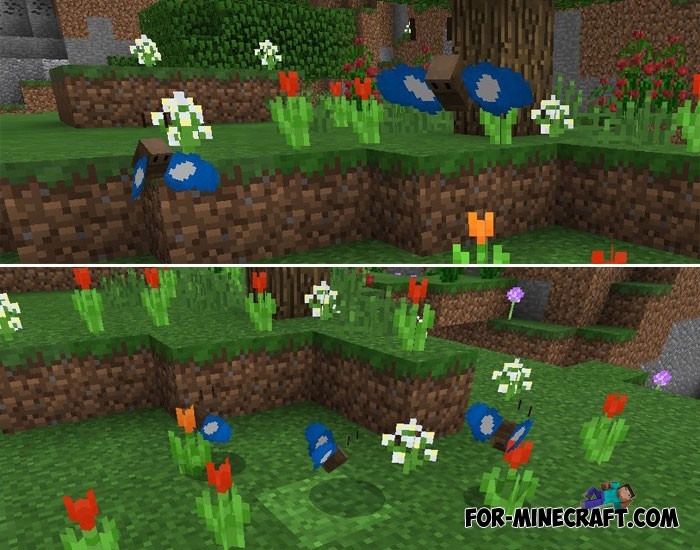 Butterflies are not one of the features of Minecraft so far and even the next update 1.3 does not involve their inclusion, although on the other hand we can clearly expect dolphins, turtles, many other creatures. If you have a huge desire to add butterflies toMCPE then the easiest option is to install this addon. Butterflies have only one coloring unfortunately since they replace bats. Accordingly, butterflies appear in dark places and this can not be corrected in any way. Also butterflies can make a specific sound so it's best to keep them somewhere in the garden or greenhouse.